In the 1990s, the term “medical computer” didn’t mean much more than a PC in a doctor’s office, or computers set up specifically for order entry, medical database access, or patient surveys. The equipment itself wasn’t anything special or purpose built for the medical field. Nowadays, a medical grade computer is expected to provide clinical resources, constant uptime, and also protect patients and staff from the spread of infection. Mobile clinical carts use medical panel PCs for in-room patient care, staff use tablets to put in patient meal orders or pharmacy orders, and even the LCD monitors are of a certified medical grade. Modern CDC guidelines require that medical computers be UL/IEC60601-1 certified after in-depth testing for safe use near patients, other medical equipment, and performance compliance. Antimicrobial coatings on medical computers have the capability to kill or inhibit the growth of microbes on their surface or surrounding environment. The antimicrobial agents are formulated for low toxicity, minimal environmental problems, and prolonged lifetime of the computer components the agent is applied to. Tangent’s medical computers are not only 60601 certified and antimicrobial, they are also IP rated to prevent ingress of water or contaminants. The Medix C24 medical computer has an IP65 front panel. It’s also loaded with I/O ports and mounting options so that it can be used for carts, arms, desktops, or anywhere it’s needed. In addition to being suited to safety and sanitation needs, medical grade computers have to stay at the forefront of technological advances in order to serve ever-changing clinical requirements and advances. As soon as touchscreen technology became widely available, they started being integrated into medical devices and hospital workflows. 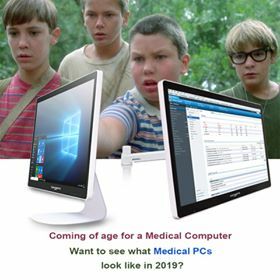 Tangent’s M24T medical computer offers PCAP multi-touch, up to 32GB of memory, Intel Core processors, advanced graphics capabilities, and a built-in webcam. Why is a webcam important? Telemedicine or “virtual visit” doctor appointments have become a popular alternative to in-person visits. Patients can conduct live video chats with a doctor 24-7 via web meetings. The M24T medical computer also has a UPS battery backup. If a doctor is meeting with a patient and the power goes out, the meeting can still proceed uninterrupted. Tangent’s computers are also validated to work well with popular EMR software packages like Cerner or Epic. Medical computers have come a long way over the decades; they are safer, sturdier, more secure, and reliable than ever. Tangent’s industrial and medical PCs have far too many features to mention in one article, but they are all built to provide the most utility, versatility and value to its users.